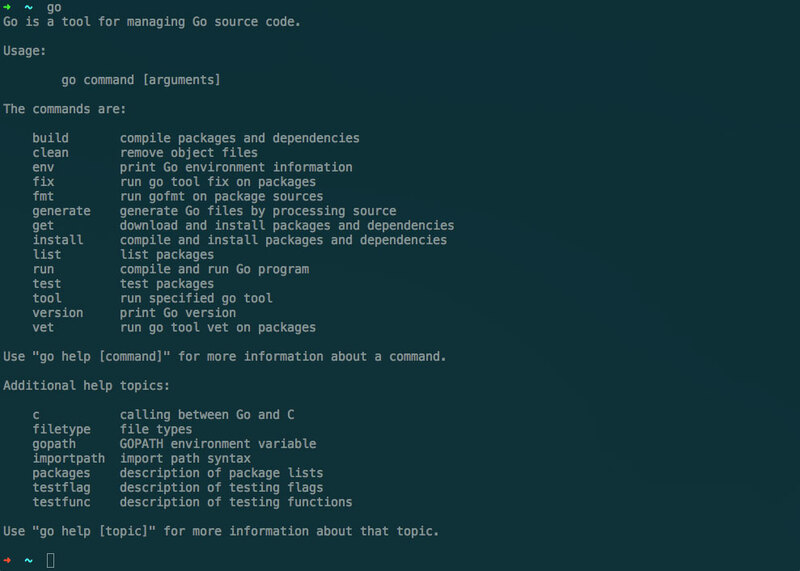 Go or Golang is a server side technology initially developed at Google. You can use Golang to build some kickass server side applications or use it to build fast command line tools. Golang compiles to machine code, which makes it very fast and reliable. It's no wonder that this language is quickly becoming very popular and widely used. 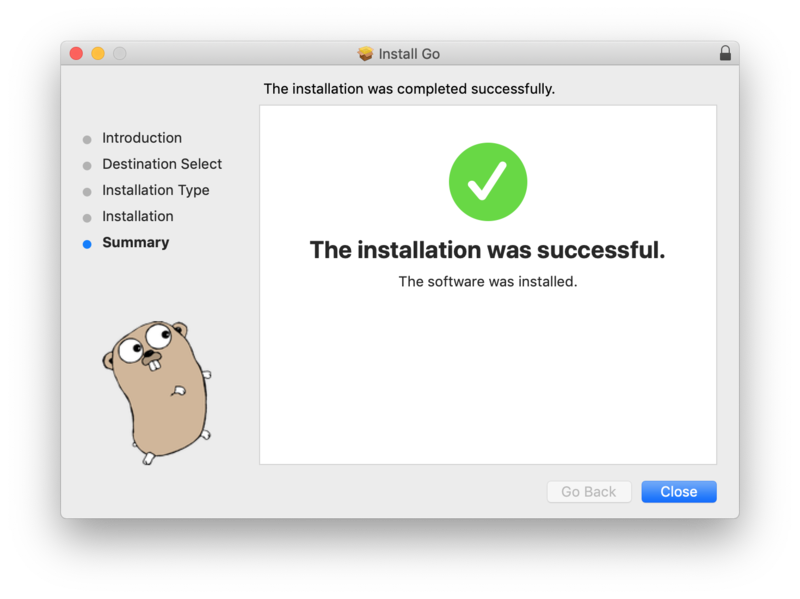 Let's move along to installing Golang. 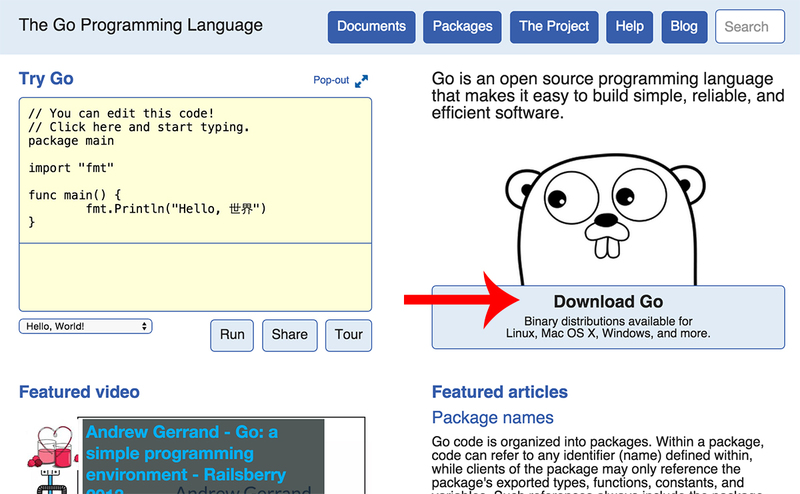 Then at https://golang.org/dl download the latest version of the installer (the latest version is usually in bold text). 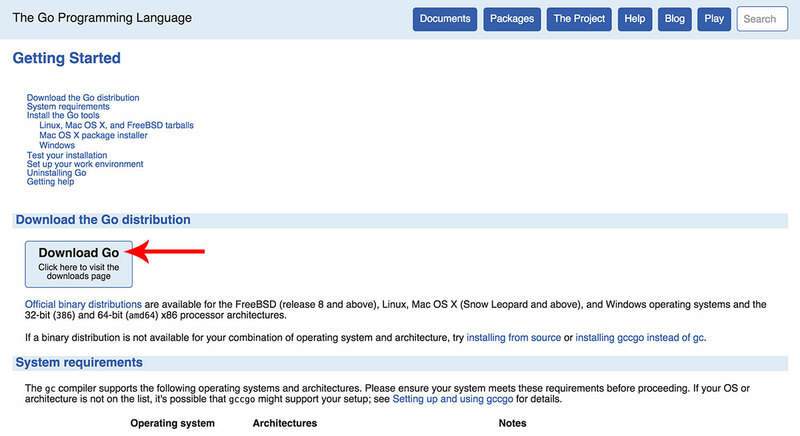 The .pkg file is for Mac, .tar.gz for Linux, and the .msi is for Windows. Open the installer and let it do its thing. Click continue, next, install, etc. until you reach the end of the installer. After the installer has completed, you may need to shut down your shell prompt, terminal, or command prompt depending on which operating system you are using. Then open up a new terminal or command prompt, type in the word go, and press enter. You should now see a list of available commands. And just like that you’ve installed Go on your system. Next let’s take a look at how we can use these awesome new Go commands. Quick Note: make sure you are using double quotes instead of single quotes or you will receive an error when trying to run the program above. BAM! You just wrote your first Go program. Yeah… It doesn’t do much, but it’s all good because we're just getting started. Packages are source files and libraries that we can re-use in any of our Go programs. Similar to NPM for Node and Composer for PHP, Go has a package manager that you can use to include packages into your Go program. You can take a look at the many Go packages available at the Gopm Registry. Packages are great for writing some code and easily being able to re-use it in another program you create in the future. There are also many third-party packages available to use in your app. Next, we're going to take a look at installing and using a package in another example program. If you are on a Windows or Linux machine, you can check out the following article on where to set your GOPATH variables. Moving on... Let's run the package installer command again. And if you run the command and don't see any kind of output, that means it has been successfully downloaded. Note: If you check the location of your Go Path, you'll see that the package has been downloaded in the 'pkg' and 'src' folders. Then, navigate to that file from terminal or command prompt and run the program. Just like that we used a third-party package to easily add a loader. Notice: Since we've specified our GOPATH in the steps above, you won't have to do this again, so adding and testing out other Go packages will be much easier in the future. In this article we only went over writing a few scripts in Golang; however, there is so much more to learn about this amazing language and how you can use it to build some awesome apps. Check out the links below of some cool apps written in Go. Get ready, set, Go create some awesome programs.